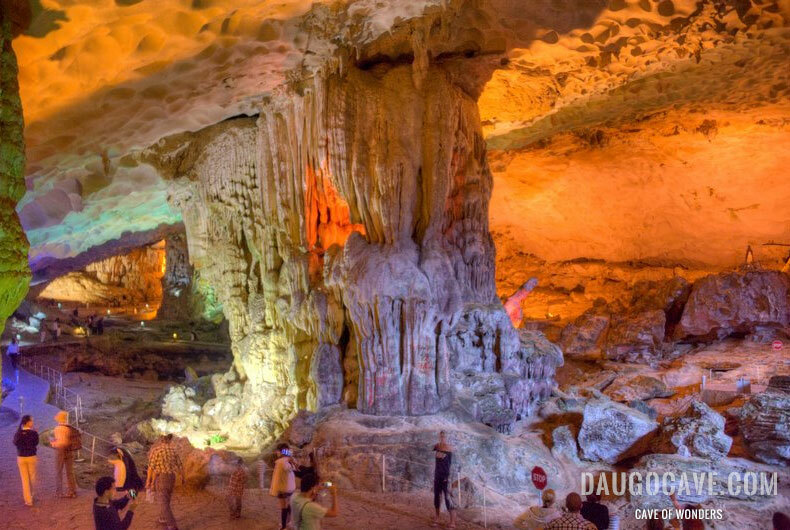 Dau Go Cave was created in Pleistocene epoch around 2 million years ago. The cave is 27 meters above the sea level. The entrance is 12 meters wide and 17 meters high. Inside the cave is a huge space with the size of 5.000 square meters. The height of the dome is 25 meters. Entering the cave, tourists will discover a magnificent world of stalactites and stalagmites which are the result of karst process in a long period. They are presented in various sizes and shapes. They seem like lively statues, reliefs about nature and people on Halong Bay. These masterpieces of the Creator will certainly be very impressive to visitors coming to Halong bay, especially when accommodated with mysterious light. There several versions of story about the cave’s name were told by local residents of Halong. One of them is linked with historic battle against Mongolian invaders under Tran dynasty in 13th century. The story told that Dau Go Cave was the place hiding wooden stakes before they were driven into Bach Dang River. These stakes created a trap to destroy the enemy’s ships. Therefore, the cave then is called “Dau Go” (wooden stakes).